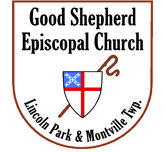 Good Shepherd Episcopal Church established the web site www.goodshepherdepiscopal-mlp.org, and related listservs, to facilitate communication and sharing of information within the parish, and also, in the case of the web site, as a medium for evangelism. It is important to remember that the web site and listservs are an extension of our parish and a direct reflection on us as stewards of God's Word. Use of the listservs by anyone other than Good Shepherd parishioners, clergy, or staff. Good Shepherd Church is not responsible for the content of other web sites linked through www.goodshepherdepiscopal-mlp.org. Good Shepherd Church reserves the right to restrict, at any time, access to any portions of the web site that are deemed to be of a sensitive nature, by means of passwords or other means. Good Shepherd Church reserves the right to discontinue any or all online services at any time or to revise the terms or content of this policy.